Some user are facing problem majorly with iOS7/8 that after creating a new ring tone of .m4r tone ,~25 seconds long -> got it into iTunes( plays well). In itunes Checked the box for tones sync, and also synced music at the same time. Once sync is successfully done new Ringtone won't show up in sounds options of iphone Even after doing multiple sync with iTunes it does not works. Renamed both the file and the song to just one word and try to sync again, this may work for you. Try to delete the AAC version you created in your music library on itunes. Then, go to the ringtones section under your iphone and deselect to sync, then when it's finished select it to sync all ringtones again. From the RINGTONES menu under LIBRARY (If it's not listed under library, you can show it by going to EDIT > PREFERENCES), right click on the ringtone name, and click GET INFO. From there, under the INFO tab, make sure that the name and artist of the song is populated. Click OK. Do this for all the ringtones that you want to transfer. 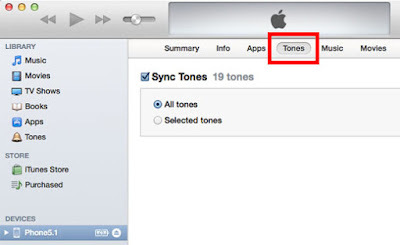 Next, under DEVICES > Your iPhone name > RINGTONES, make sure SYNC RINGTONES is checked. I clicked SELECTED RINGTONES, and selected the ringtones that I wanted to sync. Then click SYNC on the bottom right of that screen. Should work. 4)on the top you have options example: summary - info - apps - ringtones. 1) In iTunes menu select "Store," then "De authorize Computer"
2) Then select "Store," then "Authorize Computer"
3) A message will pop up saying "X out of X Computers are Authorized" or something to that effect. That what i need, thank so much! Downloading the iphone ringtone is easy now!